Quest loves PowerShell and many Quest teams have implemented powershell interfaces to their IT management products – I from my side am obviously willing to promote and encourage these efforts. Our Quest Management Xtensions team is in charge of over 400 (!) extensions to Microsoft Systems Center, letting you use Operations Manager, Configuration Manager, and Opalis with variety of non-Microsoft platforms. And today I am excited to announce that this team released a PowerPack for their tool! So not only can you get more out of your Systems Center tools, you can also now get extensible alternative user interface to the tools, and can further automate various operations with PowerShell. You can learn more about Management Xtensions and download them here, and the PowerPack here. 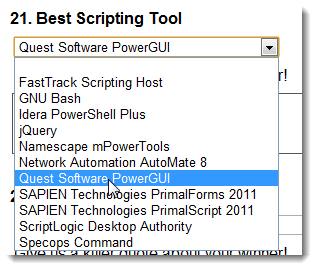 Another plug to my fellow Questees who have gone PowerShell (that’s the deal we have here at Quest – you add PowerShell to your product and get a special blog mention and lots of happy customers!). 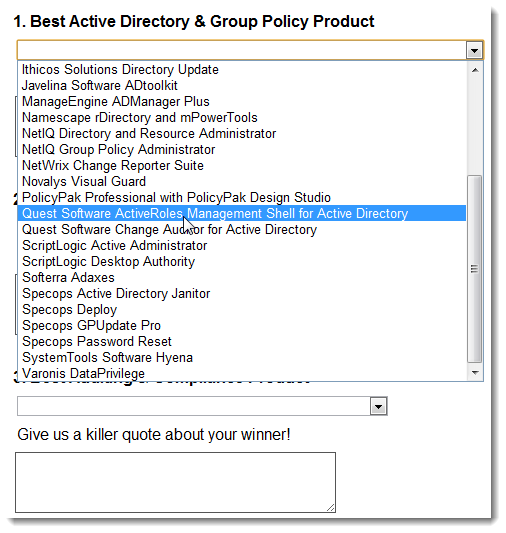 Quest’s Defender (Two-Factor/Multi-Factor Authentication solution) team has just updated their PowerShell module and there’s quite a few useful cmdlets for user provisioning, de-provisioning and general Defender auditing / administration. To assist with the de-provisioning of users accounts from Active Directory when a user has left the company simple commands such as Remove-AllTokensFromUser could be used to ensure all tokens that have been assigned to a user are removed. As you can see this is a lot more than what we could previously provide with the AD cmdlets integration that we had. You can get a free trial of Defender here. Here at Quest we strive to PowerShell-enable pretty much everything we see. 🙂 The newest Quest team to have gone PowerShell are our desktop virtualization folks – vWorkspace. They recently released a PowerShell module for vWorkspace that – as you could probably guess – adds great automation capabilities to the product. Setting a wide range of properties on the virtual machines and computers hosted by vWorkspace. If you’re a vWorkspace customer, definitely check out the new module on the Quest Community site. They regularly make new versions available, adding more and more functionality each time. Often there’s also a beta of the new upcoming version of the vWorkspace PowerShell module available for anyone to test. In addition, there are some cool examples of how the vWorkspace PowerShell module can be used to ease day-to-day administration of vWorkspace. Look for this kind of information in the Powershell section of the vWorkspace Community as well. I know the vWorkspace guys would love to hear some feedback on the module so please feel free to comment on their current release. P.S. Thanks to Adam Driscoll from the vWorkspace team for helping me write this post. Also, if you have not checked out his interview at the recent PowerScripting podcast – you should. He is one of the smartest software engineers I know! “What’s All This Talk about PowerShell Anyway?” which Kirk and I presented at the virtual tradeshow last week was recorded and is available here till January 22, 2010. What’s All This Talk about PowerShell Anyway? So what exactly is PowerShell? How does it make life as an Admin easier? Join this session conducted by Quest’s PowerShell MVPs, Dmitry Sotnikov and Kirk Munro, to learn more about PowerShell and see some real life examples of how PowerShell and Quest PowerGUI make managing your Microsoft infrastructure (Active Directory, Exchange, Hyper-V and more) easier! We will really start with basic overview of what PowerShell is, then compare it to other alternatives such as VBScript, then Kirk will dive into a step-by-step example of automating tasks such as provisioning in Active Directory, and then will answer any questions you might have. Besides this session the agenda is packed with a lot of useful material on Windows Server 2008 R2, AD, Identity Management, Exchange 2010, Virtualization, Cloud Computing, SharePoint, SQL, Oracle – see full agenda here. This online show is a great learning alternative if you cannot make it to TechEd Europe this year. It is co-sponsored by Quest, Microsoft, Dell, NetApp, Vizioncore, Scriptlogic, Techrepublic, Oracle Magazine, Redmond Magazine, and The Code Project. The speaker line up is also pretty good. The show last year was a success – see some feedback here – so hopefully this year it will be even better. Register for the event here and don’t forget to attend our PowerShell session! 😉 Virtually see you tomorrow!